Among which, mechanism simulation is the basic part of the other two. Through mechanism simulation, especially fully physical simulation, one can have a detailed understanding of SEE processes occurred in certain devices at certain radiation circumstances. 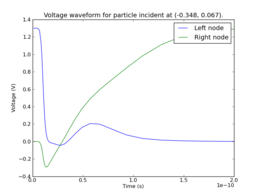 Cogenda developed corresponding pieces of software for simulating energetic particle transport and for simulating the device's response, both in different ways. Thus Cogenda has a rich series of simulation solutions. Based on complete understandings of SEE mechanism, Cogenda developed a series of prediction solutions. Beside the knowledge of some certain devices and their SEE mechanism, rate prediction requires another part of information: space radiation on its orbit. For this purpose, Cogenda developed a piece of dedicated software CRad, which deals with orbits and space radiation. SEE hardening design is the ultimate aim of SEE research, it requires full understandings of SEE mechanism, some understandings of the radiation on orbits, and of course, certain knowledge of semiconductor and micro-electronics. Cogenda has first-hand experience of SEE hardening design and now provides standard cell library development services at 130nm - 65nm technology nodes at the wafer fab of the customers' choices. The combination of these methods results in some models, as shown in figure below. Among these models, depending on the levels of details being explored, some are for mechanism simulation, some are for rate prediction, some are for both.